thinning out a bit. We design and manufacturer portable un- derwater technology that easily integrates with third party sensors, software and tooling. We realize there is not one so- lution that solves everyone’s problems, so we spend quite a bit of energy understanding what our customers are trying to do before we make recommendations – understanding that some- sometimes, our customers, equip an ROV with exactly what times we may recommend something other than a VideoRay it needs to do the mission in challenging conditions. For ex- solution. 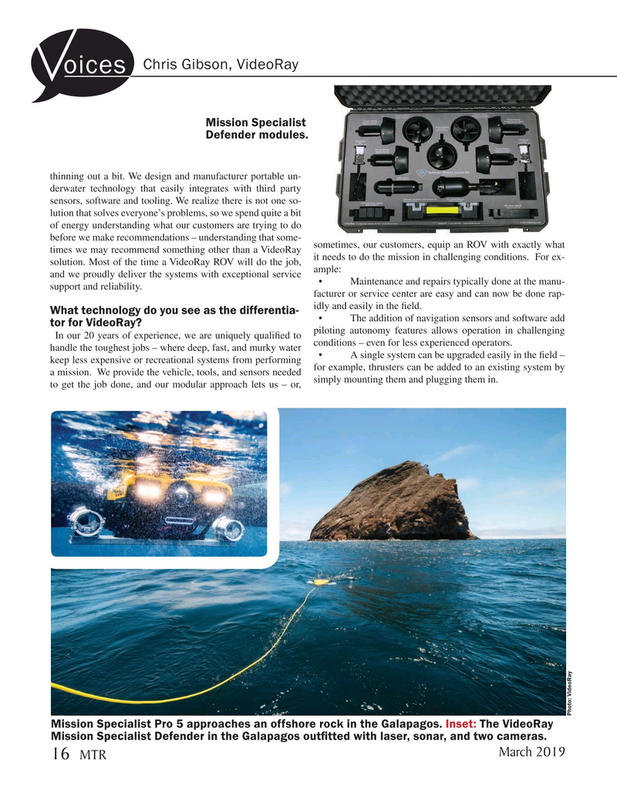 Most of the time a VideoRay ROV will do the job, ample: and we proudly deliver the systems with exceptional service • Maintenance and repairs typically done at the manu- support and reliability. facturer or service center are easy and can now be done rap- idly and easily in the ? eld. What technology do you see as the differentia- • The addition of navigation sensors and software add tor for VideoRay? In our 20 years of experience, we are uniquely quali? ed to conditions – even for less experienced operators. handle the toughest jobs – where deep, fast, and murky water • A single system can be upgraded easily in the ? eld – keep less expensive or recreational systems from performing for example, thrusters can be added to an existing system by a mission. We provide the vehicle, tools, and sensors needed to get the job done, and our modular approach lets us – or, simply mounting them and plugging them in. Mission Specialist Defender in the Galapagos out? tted with laser, sonar, and two cameras.